View from the Chorokhi Delta to the south. Photo by Brecht De Meulenaer. The Chorokhi delta lies just 5km south of Batumi, and no doubt is the best birdwatching site in the region. It offers a wide diversity of habitats, ranging from marshes and ponds to gravel beaches and from mudflats to reedbeds. 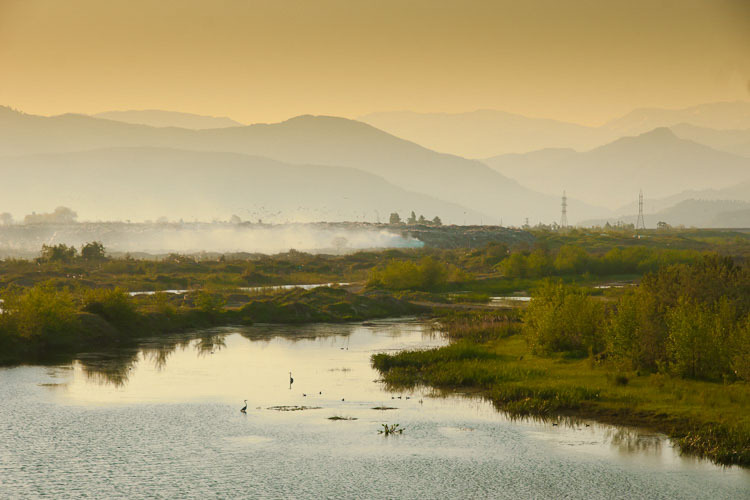 This and its strategic location at the south end of the West-Georgian plains make the delta a spectacular, ever-changing bird paradise, where virtually any species migrating through this part of the world can be expected. The area is most noteworthy for its diversity of waders, herons, crakes and terns, and for its wealth of passerines hiding in its bushes and reedbeds. Over the years, many vagrants have turned up at the site, including Buff-bellied Pipit, Lanceolated Warbler and White-tailed Lapwing. Other rarities, such as Blue-cheeked Bee-eater, Sociable Lapwing, Paddyfield, Booted and Blyth’s Reed Warbler are (almost) annual. A ringing station has been operating in the delta almost annually since 2010, and this activity has helped to demonstrate the importance of the area is a stop-over site for migrants. From the seaside, dolphins can often be observed, including Harbor Porpoise, Bottlenose and Common Dolphin. Their numbers peak in late winter – early spring. Choroki Delta. Photo by Brecht De Meulenaer. The delta is most easily explored on foot, but water levels vary considerably and can make some of the foodpaths difficult or impossible to pass. Appropriate footwear is recommended. When the migration has been good, you can easily spend an entire day exploring the different parts of the delta. An annoying fact during autumn is the high hunting pressure. On some mornings, up to 50 hunters can hang around in the area, killing virtually every species. Although they usually behave in a friendly way, we advise you to be careful and not to look for a confrontation with them. A suggested walk starts in the grassy plains to the east, where usually a few flocks of Lesser Short-toed Lark are present, and flocks of Rose-coloured Starling hang out in late spring or early autumn. Every now and then, a Stone Curlew stays around, and on the ruins you may be lucky to find migrating Eastern Black-eared or Pied Wheatear, but Northern and Isabelline are more common. The bushes around this area are often loaded with Red-backed and Lesser Grey Shrikes, with smaller numbers of Woodchats. This is also a good place to look for Warblers, including Barred and Booted. From here, you can move to the river and look over the floodplains. The quality of these varies with the water levels which are regulated by dams further upstream in Turkey, but this is a good spot to watch for herons, gulls and waders. Glossy Ibises can often be spotted on one of the island, and Gulls include Heuglin’s, Slender-billed and Armenian. Sometimes, Black, Whiskered and White-winged Terns hunt insects over the river. 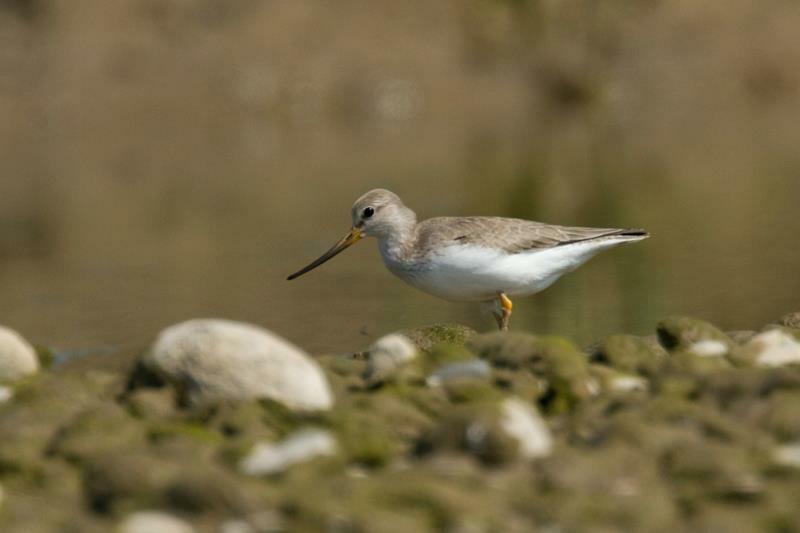 Check the sand and gravel bars carefully, because a Kentish Plover, Terek Sandpiper or Collared/Black-winged Pratincole may be hiding! In early October, enormous flocks of the latter can visit the delta, with over 3000 recorded in autumn 2014. Following the river bank towards the mouth is difficult, and you may need to take a more direct course towards the beach. A look over the sea may yield Arctic and Parasitic skua, Yelkouan Shearwater, Little Gulls and often good numbers of dolphins or porpoises. In winter, you can watch Dalmatian Pelicans and hundreds of Black-throated Loons here. From here, walk towards the river mouth, and you will see a number of small creeks. These can be good for waders, especially Terek and Broad-billed Sandpiper. Gull-billed terns often hang around in this area. If you follow the coastline in the other direction, you will reach a series of ponds. It is worth taking your time here, because each pond is quite different. In the open ones you will find many Citrine Wagtails and sometimes Ducks like Ferruginous, while the more closed ones are very good for crakes (Spotted, Little, Baillon’s Crake, Water Rail are all regularly recorded here! ), while purple swamphencan occasionally be seen but has become much rare over the past five years, presumably due to hunting. Some ponds are covered in reedbeds, and here you can find Little and Great Bittern, and in early spring or late autumn also good numbers of Moustached Warblers. From the ponds, it is easy to walk southwards, towards an old road that takes you straight back towards the entrance. However, it is worth checking the southernmost corner of the delta just past the end of this road, a small meadow which often holds amazing densities of migrants.